This is a boutique bakery and we book up quickly. We need at least 2 week’s notice for birthday cake orders and 6-12 months for wedding orders. If you have reserved a date months in advance you must contact me 2 weeks prior with the details of your order. For availability, a quote, or to place an order please contact me by email only, as I work odd hours and won’t be able to return phone calls. Rebecca Bell’s Cakewalk Catering is a specialty cake and dessert company located in Dwight, Ontario, a scenic village at the gates of Algonquin Park. Specializing in wedding cakes, custom birthday party cakes and edible gifts for all occasions, the unique and innovative products from Cakewalk have delighted cottage and resort-goers, as well as locals, for years. Muskoka’s best-kept secret, Rebecca Bell has worked at Lumina Resort and the renowned Deerhurst Resort in the pastry department for over 20 years combined. 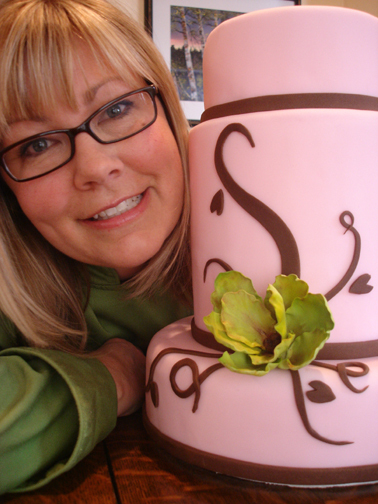 She also helps cottagers ‘wow’ their guests with unique Muskoka desserts that show a discerning hostess ‘in the know’. Rebecca’s designs are limited only by her imagination – or yours! Email with your vision and see how memorable a cottage country occasion can be.